When it comes to feeding your dog, it’s vital that you select a product that features the very best ingredients and is specially formulated to meet the unique nutritional needs of your pup. But while there are dozens of dog food brands on the market, the simple fact is this: not all dog foods are created equal. In fact, many products contain artificial ingredients, additives, fillers, and dyes that have been found to cause serious health issues. To ensure that your puppy pal is getting the nutrition that he needs, selecting a dog food that is made by a reputable manufacturer and contains only the best possible ingredients is absolutely essential. One of the latest dog food brands comes from celebrity chef, talk show host, and author Rachael Ray. But of the many roles she fills, her very favorite is the role of a dog parent. She is always talking about her dogs and speaking up for animal rights. That’s why she decided to start her very own line of dog food, known as Rachael Ray Nutrish. But what is Nutrish dog food all about? Why should you consider feeding it to your dog? What are some of the best formulas available? In this review, we’ll answer these questions and more. But first, let’s take a look at the best Rachael Ray Nutrish Dog Food options that are on the market. We’ve consulted with animal nutritionists and veterinarians to get their input about the features and ingredients that high quality dog foods should contain. We also read through several Rachael Ray Nutrish Dog food reviews to see what pet owners had to say. Our research has allowed us to narrow down the options and choose what we believe are the top five Nutrish dog food options. Now that you have seen our top five Rachael Ray Nurtish dog food options, let’s dive in and take a closer look at each one. Below, we offer a more detailed review of each of these products, including the ingredients that they contain, what we like about them, and what customers have had to say. Once you read through the articles and select the product that you think will best meet the needs of your pup, click on the buttons to find the best prices currently available on Chewy and Amazon. Whether you have a Rat Terrier or an English Toy Spaniel, a Pug or a Chihuahua, you’re going to want to feed him a premium quality food for small dogs. Small dogs have unique nutritional needs, and it’s important that you feed a small breed food that will meet those needs. The kibble in Rachael Ray Nutrish Natural Dry Dog Food is smaller than the kibble that is found in food for large dogs so your small breed will be able to eat it with greater comfort. But the smaller size of this dry dog food isn’t the only reason why it’s such a good choice for pups’ that are of a smaller stature; it’s also because it contains premium quality ingredients. The first ingredient in this recipe is pure animal protein that’s sourced from natural chicken that has been deboned. The remaining parts of the chicken have been ground into a chicken meal and mixed into the formula to increase the protein content and the flavor, too. Protein is vital for all dogs, but particularly small breeds that are often prone to joint issues. Other natural ingredients that are featured in this recipe include peas, beets, brown rice, and carrots. It’s also infused with a full spectrum of vitamins and nutrients, such as vitamin E, zinc, vitamin B12, vitamin D, vitamin K, folic acid, potassium, copper sulfate, vitamin A, and more! It’s also completely free of byproducts, fillers, wheat, and gluten, as well as artificial flavors and preservatives, so you can rest assured that your pet will be receiving the very best nutrition. 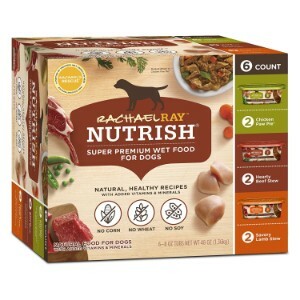 Final Verdict: If you are looking for a high quality dog food for your small pup, Rachael Ray Nutrish Natural Dry Dog Food is a great option to consider. It’s specially formulated to meet the unique dietary needs of small dogs, and it contains all natural ingredients, as well as a host of vitamins and minerals. Most users said that their dogs love this formula. If your dog has a sensitivity to grains or you simply don’t want to feed them to him, you might be considering serving him a grain free dog food. Rachael Ray Nutrish Zero Grain Natural Grain Free Dry Dog Food is a great choice for dogs of all sizes and stages of life. This recipe is completely grain free and gluten free, which makes it easy to digest, making it a dog food for sensitive stomachs, as well as a dog food for allergies. In other words, no matter what your pet’s dietary needs may be, you can rest assured that they will be met with this formula from Rachael Ray. As with all Nutrish dog food products, this formula features real animal sourced protein as the first ingredient. In this recipe, the protein is procured from turkey that has been raised on US farms. The second ingredient is turkey meal, which offers vital B vitamins and amino acids to promote maintain lean muscle mass and healthy organs. Additionally turkey meal contains glucosamine and chondroitin, which help to support joint health. With this grain free formula from Nurtish, you will also be offering your pup the goodness of whole potatoes, peas, tapioca, and beet pulp. 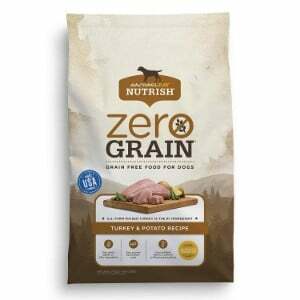 Infused with a range of vitamins and minerals, Rachael Ray’s Nutrish Zero Grain Natural Grain Free Dry Dog Food is a well balanced meal that is highly recommended by veterinarians, animal nutritionists, and pet owners. Final Verdict: Rachael Ray Nutrish Zero Grain Natural Grain Free Dry Dog Food is specially formulated for dogs that have sensitive tummies or allergies. It is easy to digest, tastes great, and contains all of the essential nutrients that your pup needs for maximum health. 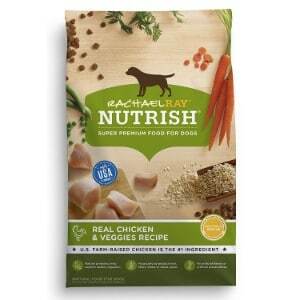 Next up on our list of Rachael Ray Nutrish Dog Foods is her DISH formula. This recipe is formulated to offer dogs of all ages, breeds, and sizes the nutrition that they need. Featuring real beef that has been flavored with natural hickory smoke flavor that your canine companion will love, as well as chicken meal, poultry fat, a pea protein, this recipe packs high protein content, making it a great high protein dog food for your pooch. Other ingredients include natural fruits and vegetables, including dried apples, dried potatoes, cranberries, carrots, peas, and brown rice, this Nutrish formula is as delicious as it is nutritious. It’s also formulated with a wide variety of vitamins and nutrients, including vitamin, vitamin B12, vitamin A, calcium, thiamine, biotin, vitamin C, manganese, and copper. To round out the nutritional profile in the DISH recipe from Nutrish are brown sugar and sunflower oil. 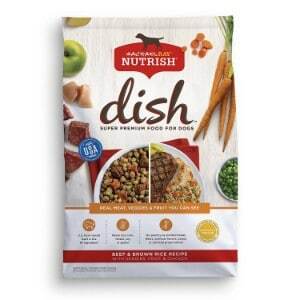 Final Verdict: For a high quality, flavorful, and very nutritious dog food that your dog will love, Rachael Ray Nutrish DISH Dog Food is an excellent choice. The majority of customers who have used this product say that their dogs love it, and veterinarians highly recommend it. It features all natural ingredients and is free of additives and fillers. If you are looking to feed your dog a diet that closely resembles the food that his ancestors ate when they hunted and forged in the wild. PEAK from Rachael Ray Nutrish is a wonderful formula to consider. It’s specially formulated so that it contains a bare minimum of 30 percent high quality proteins that are sourced from beef that has been raised in the US, as well as venison and lamb meal. A high protein diet is important for your dog, as this vital nutrient helps to support joint and muscle health, and with this recipe, you can be sure that your dog will be getting all of the protein he needs to thrive. In addition to the high levels of premium quality protein that this recipe contains, it also features a blend of farm fresh vegetables, including potatoes, peas, and sweet potatoes; natural carbohydrates that are easy to digest. They’re also gluten free, so they won’t upset your furry pal’s tummy. To add to the nutritional content, this Nutrish formula from Rachael Ray is infused with glucosamine and chondroitin, which help to foster even stronger muscles and joints. With no fillers, artificial flavors, or artificial preservatives, this is a fantastic natural dog food. 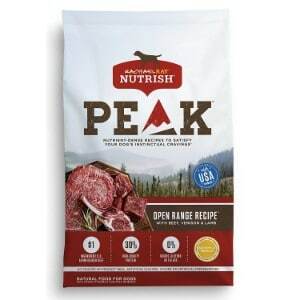 Final Verdict: With Rachael Ray Nutrish PEAK Natural Grain Free Dry Dog Food, you’ll be able to keep your pooch happy by satisfying his instinctual cravings for meat. This recipe is made with real US farm raised beef, venison, and lamb, as well as easy to digest carbs. Pet owners and veterinarians highly recommended it. If your dog is finicky and doesn’t like dog food, or he has sensitive teeth and requires softer food, feeding him a high quality wet dog food, like Rachael Ray’s Nutrish Natural Wet Dog Food is a great option to consider. Featuring three different types of wet food formulas, you’ll be sure to keep your pup’s taste buds happy with Nutrish Natural Wet Dog Food. Beef Stroganwoof features tender and tasty beef, green beans, tomatoes, and pasta. All ingredients mixed together with beef gravy and slowly simmered. Chicken Muttballs with Pasta contains real chicken meatballs mixed with carrots, spinach, and pasta that are all cooked in chicken broth. The Hearty Beef Stew recipe features chunks of natural beef, carrots, potatoes, and peas. All of the ingredients are combined in a beef gravy and slowly simmered. Of course, like all Nutrish products from Rachael Ray, the wet dog food contains no artificial flavors or preservatives, and is infused with vitamins and minerals to ensure optimal nutrition. Final Verdict: For a premium quality wet food that your pup will be sure to love, Rachael Ray Nutrish Natural Wet Dog Food is a great option. Most pet parents say that their dogs love the taste, and veterinarians highly recommend it. Your top priority as a pet parent is to ensure that your dog is receiving the best care possible. That’s why you have gone out of your way to fully research the products that you choose for him, including his dog crate, dog bed, dog playpen, dog house, outdoor dog kennel. You’ve also taken every effort to make sure that you select the most secure dog collar and dog harness for those walks that you enjoy together. And of course, you make sure that he is entertained with the best rated interactive dog toys, puzzle dog toys, and even automatic fetch machines when you can’t play with him. But of all of the products that you invest in for your pup, there’s one that needs that is more important than the rest: his dog food. The food you offer your pup is vital, as it ensures that his nutritional needs are being meet. But, while choosing a food for your dog might seem like an easy task, it’s actually more complicated than you might think. There are so many options, and not all of them feature the best ingredients. But Rachael Ray’s Nutrish is one of the most highly regarded dog food products available. But why is it so high quality and why should you consider feeding this food to your dog? In this section of our review, we’ll answer these questions and more. Made by Rachael Ray, a beloved celebrity chef and TV personality, Nutrish first came onto the market in 2008. Ray, who had lost her Pit Bull Terrier, was contacted by Ainsworth Pet Nutrition, a pet food manufacturer. Together, they decided to go into business to create the best quality foods for dogs in order to ensure optimal nutrition. Almost as soon as it was introduced, Nutrish became one of the most popular brands of dog food; not only because it’s made by a beloved celebrity, but more importantly because it features such incredible ingredients. As we’ve mentioned, not all pet food manufacturers use the best quality ingredients in their products. In fact – and unfortunately – many manufacturers fill their foods with fillers, additives, and other artificial ingredients that have been found to cause adverse reactions. But that’s not the case with Nutrish by Rachael Ray. Real meat this is raised on US farms. Meats include turkey, beef, and chicken, as well as venison, lamb, and pork. All of the meats are carefully deboned to ensure safety, and are used as the first ingredient of her foods. Farm fresh vegetables, including tomatoes, carrots, peas, white potatoes, and a wide variety of other veggies. All of these vegetables are selected because they are excellent sources of essential vitamins and minerals. Plus, they are very easy to digest, so they won’t aggravate even the most sensitive canine stomachs. Not only do all of Rachael Ray’s Nutrish pet foods feature high quality ingredients, but they are also completely free of fillers and additives. So, why should you consider feeding your pet Nutrish dog food by Rachael Ray? Put simply, it’s because it contains a variety of the highest quality ingredients found in dog food products. You can ensure that all of your dog’s nutritional needs are being met, and you can also count on the fact that he will love the flavor. Plus, Rachael Ray makes a wide variety of different Nutrish formulas, so you should be able to find an option that will work for your four-legged family member’s unique nutritional needs. Whether you have a large dog, a small dog, a puppy, an adult dog, or a senior dog, Rachael Ray’s Nutrish will keep him well nourished. The food you choose to feed your dog is of utmost importance. There are so many different products on the market, but not all of them can be trusted to provide the nutrition that dogs need to thrive. However, Rachael Ray’s Nutrish is a food that you can definitely count on to keep your pet happy, healthy, and properly nourished. Featuring only the highest quality ingredients, including meats that are raised on US farms, farm grown vegetables, and a wide range of vitamins and nutrients, your pet will love the taste of Nutrish dog food by Rachael Ray. While we think that the five formulas that we featured on this list are the best options offered by Rachael Ray Nutrish, any of the formulas that you choose will be sure to satisfy your dog, as well as you!